The Resort at Pelican Hill is known as one of the most exclusive wedding venues in California. Moreover, along with the Belmond Hotel Caruso on Italy's Amalfi Coast, the One and Only Palmilla in Los Cabos, and the Alila Villa Uluwatu in Bali, Town and Country Magazine describes it as one of the twenty most luxurious wedding venues in the world! Located on the rugged California coastline of Newport Beach, the property's iconic Italian rotunda is the dream location of many brides to exchange vows. We love photographing weddings at Pelican Hill; the beauty of its oceanview setting, combined with the gorgeous and unique ceremony pavilion make it a favorite. 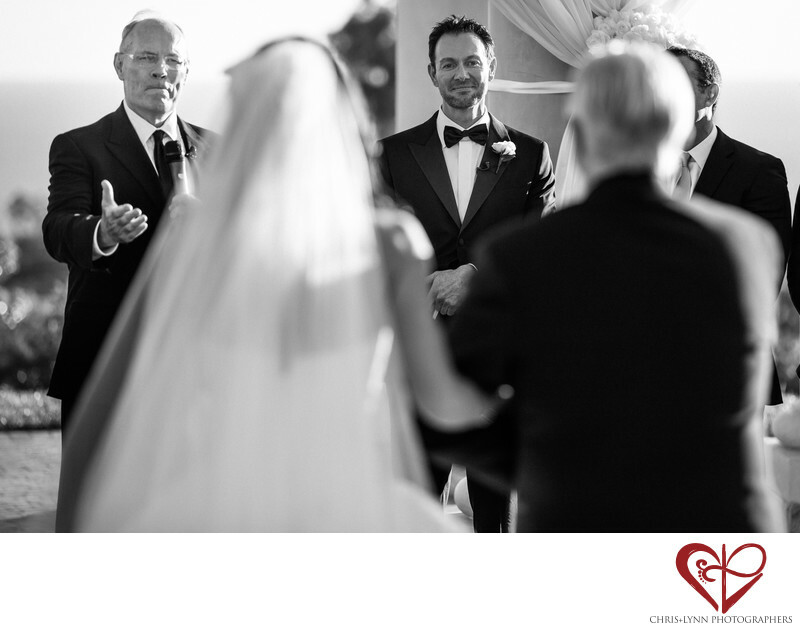 Although having a First Look before the ceremony is becoming more popular, many couples choose to stay with tradition and see each other for the first time when the bride walks down the aisle. The moment the groom sees his wife-to-be for the first time is always poignant whether he reacts with a joyous smile, an adoring gaze, or emotional tears. I love the groom's expression of love and devotion this groom is giving to his bride and the minister's open palm beckoning the her to him. 1/1000; f/2.8; ISO 100; 165.0 mm.